Greetings from weirdly warm and sunny Seattle! I use the term "weirdly" because this summer has been too hot and dry for my liking. I'm used to rain gear, fleece, and extra socks in my backpack - year round. But whatever your weather has been, have you been getting out on hiking adventures? Please let the answer be YES! This month, I'm sharing a quick video for a feminine hygiene product (a "FUD", to be exact), a great gift idea for hikers, and an interview that explains why I write this blog. this video on my own, but I do hope it amuses you. However, I can't recommend this product because of its use of "disposable" plastic bags - no such thing in the wilderness, right? But it is definitely one answer to our dilemma of how to take care of business! Take a look, then send me your comments: Is this a usable product for female hikers? Or not? Here's a great gift from my husband that I had to share with you! He took one of my favorite hiking photos of Mt. 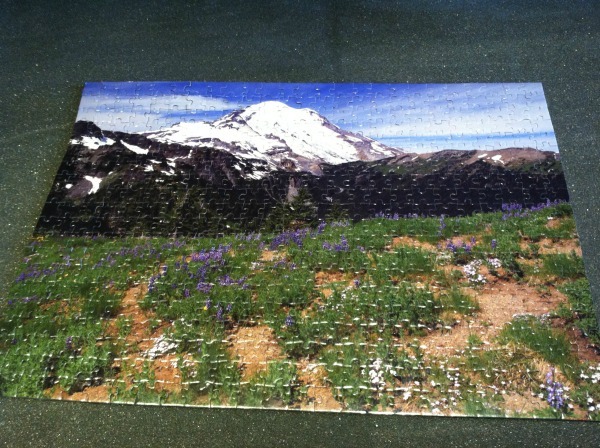 Rainier and had it made into one of my favorite things: a puzzle. I think you can see that it makes a really challenging puzzle! I spent hours trying to get the flowers put together. Of course, any photo would work, but I think this is a wonderful way to share memories of your favorite trails. Here's the link to the company he used. Why DOES She Do iI? No one has ever asked me why I spend time writing about hiking. May your boot soles be a little thinner, your pack a little scruffier, and your heart a little lighter when you open up next month's newsletter! And don't be shy about contacting me before then. I love hearing about your adventures, and welcome any hiking questions you have.